Commercial pilot can carry gun in cockpit yet name is on terror "watch list"
SAN FRANCISCO, California (CNN) -- James Robinson is a retired Air National Guard brigadier general and a commercial pilot for a major airline who flies passenger planes around the country. 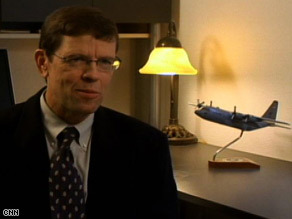 James Robinson is a retired brigadier general and a commercial pilot. His name is on the terrorist "watch list." That means he can't use an airport kiosk to check in; he can't do it online; he can't do it curbside. Instead, like thousands of Americans whose names match a name or alias used by a suspected terrorist on the list, he must go to the ticket counter and have an agent verify that he is James Robinson, the pilot, and not James Robinson, the terrorist. "Shocking's a good word; frustrating," Robinson -- the pilot -- said. "I'm carrying a weapon, flying a multimillion-dollar jet with passengers, but I'm still screened as, you know, on the terrorist watch list." The American Civil Liberties Union estimates more than 1 million names have been added to the watch list since the September 11 attacks. "There's going to come a point in time where everybody's on the list," Robinson said. Robinson is not the only person with that name flagged on the list. Since airing a story this summer about how Correspondent Drew Griffin began getting told he was on the watch list -- coincidentally after he wrote a series critical of the TSA's Federal Air Marshal Service -- CNN has received dozens of e-mails and iReport submissions from viewers who also have found themselves on the watch list. It turns out that three people named "James Robinson" found their names on the list in early 2005. iReport.com: Do you think your name is on the list? Besides the airline pilot, there's the James Robinson who served as U.S. attorney in Detroit, Michigan, and as an assistant attorney general in the Clinton administration; and James Robinson of California, who loves tennis, swimming and flying to the East Coast to see his grandmother. Denise Robinson said that no one in the government even told her her son is on the watch list but that it wasn't hard to figure out. Checking in at curbside three years ago, the family was told they couldn't get boarding passes and were hustled to the ticket counter. She said the ticket agent made a number of phone calls and kept asking which among her husband and two sons was James. "And all of a sudden he says, 'How old is he?' " Robinson recounted. She said she responded numerous times, "He's 5." The agent handed them paperwork and refused to tell them what the problem was but urged them to fill out the forms. The documents were Department of Homeland Security paperwork to get off the watch list. Not knowing which of the three might be targeted, she sent in the required documents for the entire family -- and got back one letter, addressed to James. Congress has demanded that the TSA and Homeland Security fix the problems with the list that are making travel so difficult for so many Americans. Prominent lawmakers, including Massachusetts Sen. Edward Kennedy and civil rights leader-turned-Georgia congressman John Lewis, also have encountered watch list difficulties. "I want the burden of clearing this up to be on the agencies that are the holders of responsibilities: the Department of Homeland Security and the attorney general of the United States," said Rep. Sheila Jackson Lee, D-Texas, who has called for investigations into why Griffin wound up on the list after his critical reporting. The FBI won't confirm any name on the list. And the TSA says Kennedy and Lewis aren't on the list, even though they have been stopped. But although the list is clearly bloated with misidentifications by every official's account, CNN has learned that it may also be ineffective. Numerous people, including all three Robinsons, have figured out that there are ways not to get flagged by the watch list. Capt. James Robinson said he has learned that "Jim Robinson" and "J.K. Robinson" are not on the list. And Griffin has tested its effectiveness. When he runs his first and middle name together when making a reservation online, he has no problem checking in at the airport. The TSA has said the problem lies with the airlines and threatened to fine airlines that tell passengers they are on the watch list. That didn't sit well with the airlines, who through the Air Transport Association said they have been waiting for four years for the TSA to come up with a fix. Those comments apparently sparked a recent meeting between TSA chief Kip Hawley and airline representatives. Following that meeting, a spokesman for the ATA said the airlines and TSA would cooperate to make things work. But then last week, Homeland Security Secretary Michael Chertoff seemed to re-ignite the controversy over who is to blame for the watch list failure. "We told the airlines we would allow them, if someone gave a birth date, to exclude that person from the list," Chertoff said during a question-and-answer session at the University of Southern California. "Let the person get their boarding pass directly at home or at the kiosk, just like everyone else. Some airlines have done this; some have chosen not to because they don't want to spend the money." Chertoff then implied that the financially strapped airlines might comply if they could make money from the process. "And their attitude is, 'Well, TSA gets the blame for it,' so I guess if they can do what they are doing now with food and can charge you for it -- but I hate to suggest that. I may give them an idea," he said. The ATA, the trade association for the airlines, said carriers will work with the TSA and said enrolling in a frequent-flyer program could help. "We are now awaiting TSA's announced January 2009 implementation of the Secure Flight Program, which is expected to reduce the number of misidentified passengers," the association said in a written statement. "In the meantime, the airlines worked collaboratively with TSA to further minimize unnecessary passenger inconvenience. ... A key part of that short-term solution relies on frequent-flier program enrollment to help resolve misidentification issues and as a result we are urging passengers to enroll." All the Robinsons are enrolled in frequent-flyer programs, and all have filled out the paperwork that Chertoff said is an easy way to get them off the watch list. But it has been three years since all three James Robinsons filled out those forms, and their cases have yet to be resolved.